A sunny spring day in the North often deceives the unwary walker. You can peer through your window and watch the sun glint off watery surfaces. You can enjoy how it instinctively motivates the birds to build new havens amongst the branches, and feel inspired to step out amongst the warmth yourself and absorb its life-affirming light. But when you do, the truth hits you in your limbs, in your face, your ears – the truth of the North wind and its freezing sister Temperature, and the knowledge that Winter, while unseen, lingers still. While the happiness of Ra remains, it servers only to outline a new melancholy: the frivolity of Summer lies just beyond reach. 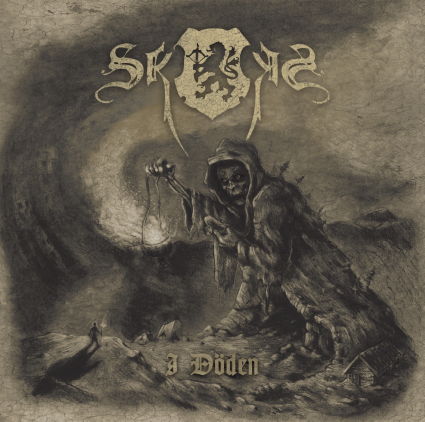 Such is the sound of Sweden’s Skogen; specifically, the sound of I Döden, their fourth and most impactful full-length to date. Besides the folk that has served them well over the years, elements of ’80s depressive/goth rock now wash up clearly from the mix, uniquely blackening their metal further with a leaden mood not unlike – and this is praise – the one permeating Type O Negative’s October Rust (check the muted refrain of I Döden‘s ‘Solarvore’ for one example). This is accomplished, of course, without any of ToN’s smirking humor. Skogen’s opposite choice of seriousness sharpens the band’s intended intended focus upon darkness, for while both groups reference Dead Can Dance and Cocteau Twins in their synths, Skogen uses these sounds to evoke the natural world, rather than the fleshly one of relationship Peter Steele inhabits on his aforementioned (and equally enjoyable) 1996 album. Make no mistake, I Döden still easily earns its black metal genre tag. The harsh vocals are as ice cold as those heard in Drudkh, a band with whom Skogen shares a kinship in tone and subject matter. The clean vocals have that Quorthon near-monotone, and complement guitars thriving in the same key for long periods. Together with a straightforward rhythym section that incorporates a midtempo feel even while occasionally blasting, something not-quite drone is crafted, as the color in the acoustic guitars and riffs prevent boredom from ever seeping in. Even the closing track ‘Sleep’, with its doom metal pace and overall sound of surrender, has that black metal heart of yearning and acceptance of impermanence that demands contemplation and introspection. While furrowing their own path, Skogen still honors emotions of the ’90s Norwegian gods. ~ by cliftonium on April 23, 2014. Does Bindrune have this in the distro yet? This entry was posted on April 23, 2014 at 8:12 pm and is filed under ALL REVIEWS, S-reviews.You can follow any responses to this entry through the RSS 2.0 feed.You can leave a response, or trackback from your own site.